The Japanese role-playing game genre, also known as the JRPG, is one that has seen a lot of changes over the years, for better and for worse. While gameplay may not have changed too much for some established franchises, the tone and overall aesthetic of these titles has become less fantastical, with swords and sorcery and sometimes robots, and taken in a new direction. To put it simply, JRPGs have become more… well, anime. Recently, Xenoblade Chronicles 2 provided a sequel to the relatively grounded Xenoblade Chronicles that, while still a great experience, tended to rely on the crutch of fanservice and anime waifus that it didn’t really need. JRPGs about J-Pop idols and high school students have become more prevalent than your average sword and sorcery romp through the countryside. Some people pine for the old days of an old-fashioned adventure through beautiful fantasy landscapes, like the RPGs on the Super Nintendo. 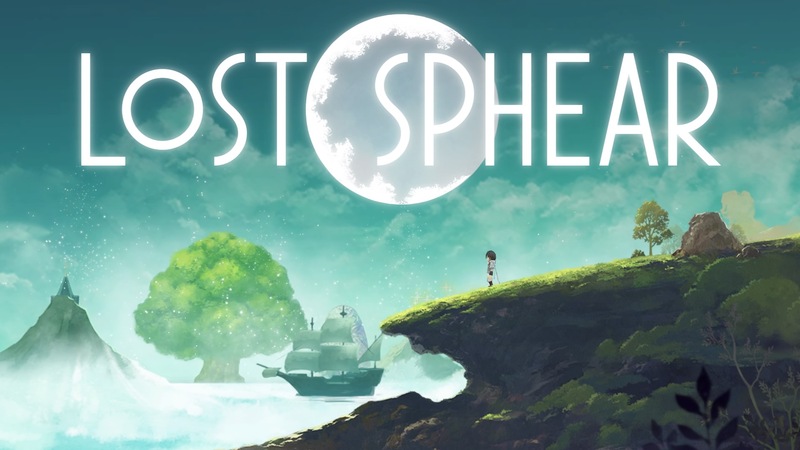 Fortunately, Tokyo RPG Factory has worked to provide experiences that emulate those golden years, first with I Am Setsuna in 2016 and now with their new title Lost Sphear. Coincidentally, for a story about the power of memories, Lost Sphear uses the memories of classic JRPGs to not only give that feel-good nostalgia, but also to create some good memories of its own. Lost Sphear’s greatest strength is in its charm. Now, this charm isn’t necessarily due to qualities that are good or bad, but it’s still charming nonetheless. For example, graphically the game is very pleasant. It has a similar style to its predecessor I Am Setsuna, essentially being a Super Nintendo RPG like Chrono Trigger, but with the beautiful 2D sprite work promoted to 3D models. These 3D models somehow hold the same charm as their 2D counterparts, even if they aren’t as visually impressive. Simple things like character movement, enemy designs, and the design of the world map are all very nice to see. The character designs themselves aren’t too interesting though, sticking mostly to traditional Square Enix character archetypes. On the bright side, the main party is a cast of varied and colorful characters, though there aren’t too many standouts compared to the main cast of games like Chrono Trigger or Earthbound, where each character is instantly recognizable. Visually, the game delivers exactly what it intends to do with no fluff or excess amounts of anime tropes. The music delivers on what it intends to do as well, though it isn’t as good as the soundtracks it tries to emulate. There’s something amazing about Super Nintendo MIDIs that no game attempting to be modern will be able to copy, no matter how hard they try. The soundtrack isn’t bad, of course, it’s pretty decent. There are some tracks I like, but none of them really stand out. In particular, the first major city in the game has music that, while good upon a first couple listens, becomes grating after the city holds the player hostage in its cycles of backtracking and running around aimlessly. Compared again to the classic JRPGs, there aren’t any songs like “Corridors of Time” from Chrono Trigger or “The Red Wings” from Final Fantasy IV that can be pulled out of a crowd as examples of good music within their respective games. To put a specific reason to why Lost Sphear feels so bland, it’s the instrumentation of the songs. Many songs rely too heavily on woodwinds and strings, while soundtracks like Chrono Trigger’s had a large variety of instruments that can be heard, even through the Super Nintendo’s sound chip. The soundtrack still has its charms and its moments, but it’s a charm that loses its luster over time. It’s like watching an enthusiastic young relative do the same cartwheel over and over again. It’s endearing at first, but eventually both you and the child start getting sick of it. The story in Lost Sphear is one that is relatively simple, but is delightfully nostalgic in all the right ways. The concept of the story is simple: you play as Kanata, an orphaned swordsman with a magical power to restore things that are trapped within a white fog. This phenomenon is referred to as being “lost.” After discovering and utilizing this strange new power, Kanata sets off on a globe-trotting quest with his friends Locke: a small boy with a crossbow and an empty stomach, and Lumina: a girl who is basically discount Tifa from Final Fantasy VII, to restore the lost parts of the world. Along the way, Kanata uncovers dark secrets of the empire he once respected, and works opposite of them despite their goals of restoring peace to the world to be in line with his. Kanata takes on large robots, sea serpents, forest monsters and the occasional imperial grunt on his quest to restore hope to a world slowly losing it. The plot is relatively simple, yes, but it’s effective. On top of that, the aspect of restoring what is “lost” is not only a story element, but also an element woven into the gameplay itself, which is always impressive. The player quite literally travels around the world, restoring the lost parts of it on the player’s time, rarely happening in cutscenes. The real icing on the cake is the writing and interactions between the main cast. The cast may be a set of classic Square Enix archetypes, but they are all still unique in their own ways. They have their quirks, and they have great lines interacting with one another. There are some lines in the game, particularly ones delivered by the mysterious stranger Van, that are actually pretty hilarious. If their goal was to emulate the writing and storytelling of the JRPGs of old, then Tokyo RPG Factory definitely nailed it. Especially when compared to the heavy-handed and cliched writing of modern JRPGs like Xenoblade Chronicles 2, this game is a breath of fresh air. 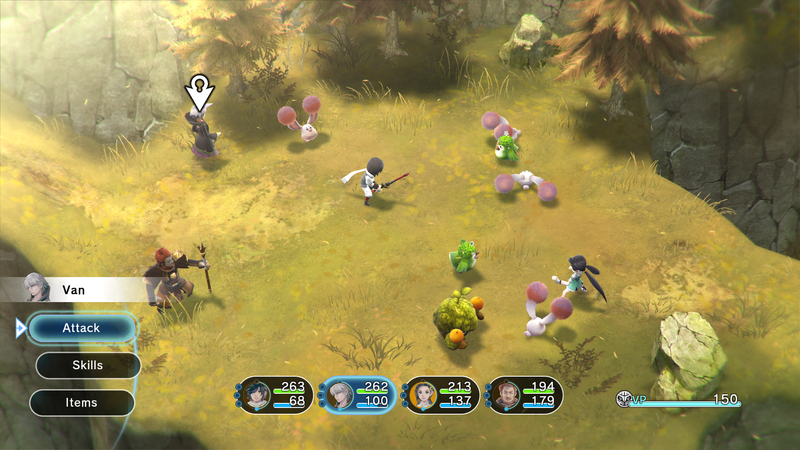 Lost Sphear’s core gameplay, at least in its combat, is the active time battle (ATB) system. This combat will feel instantly familiar to anyone who has played the Square Enix JRPGs of old. Each unit in combat must wait for their ATB gauge to fill up before performing an action. That action can be an attack, a spell, using an item, or going into a giant robot suit (because that’s a reasonable thing to do when faced with the dangers of some moss-covered penguins). Unlike RPGs like Final Fantasy IV, where both parties face each other on opposite sides of the screen, or Chrono Trigger, where the combatants move automatically, the player is given complete control of the movement of the party. Positioning of attacks and area-of-effect spells are key to quickly ending encounters. On top of that, timed hits are added through the “momentum” system, where by attacking and getting hit, characters build up momentum. By pressing a button at the right time during an attack, additional effects can be added to both basic attacks and skills. The combat starts off very slow, as moving party members in active time can be a bit of a hassle when it seems there’s no benefit to it. As the game progresses, however, positioning becomes vital in dealing with certain fights. An early battle against a giant boar essentially teaches the player to use the system of actively moving the party into more advantageous positions as to not get gored by large, pointy tusks. The closest comparison to this system of combat, other than I Am Setsuna, is probably the Hyperdimension Neptunia series, though Neptunia is classic turn-based combat rather than the ATB system of Lost Sphear. It’s a little thing, but it keeps combat engaging throughout the later portions of the game. A lot of other JRPGs struggle with this, especially ones where most encounters can be won by simply having higher numbers. Accenting the stellar gameplay is the extremely customizable system of skills and passives that Kanata and friends hold. Skills are not inherently learned by the party, they exist in items called “Spirinite.” Each party member can only equip a set number of Spirinite, but there are often more skills and passives that can be obtained compared to what can be equipped. This allows the player to specialize the members of their party. For example, Kanata can either take more offensive skills and focus on dealing higher damage, or he can take defensive skills and passives to take a more supportive role in combat. The choice is up to the player. On top of that, these skills can be given additional effects through equipped momentum Spirinite, which applies the specific effect of that momentum ability upon activating momentum mode in combat. Kanata’s Wind Blade can be given an Air Boost ability that significantly boosts the damage of the attacks. The cherry on top of this system? Each skill can be renamed to whatever the player desires, within the character limit. It’s a small touch, but there’s always some fun to be found in casting spells that are given dumb meme names. Lost Sphear is a nostalgic callback to the “golden days” of JRPGs that actually succeeds in bringing back the good times while not using them as a crutch. While the music and visuals may leave a bit to be desired, the story and gameplay perfectly emulate the style of Super Nintendo RPGs. While the $50 price point is probably too steep for a game like this, it’s easily one of the best JRPGs to be released, especially on PC. While veterans may not find anything new, it’ll still give enough good feelings and interesting fights to be worth a purchase.